This article was first broadcast in Episode One on November 29th, 2017. Lennon: So, you’ll have to forgive me. As a Brit, we don’t have “Thanksgiving” over here, so I’m not really familiar with it. When “Thanksgiving” comes up, what do you think of? Aarakocra are a race of avians from the Elemental Plane of Air who were made available as a playable race in the Elemental Evil Player’s Companion. Although gifted with the ability to fly, they suffer from a short lifespan, reaching maturity in only three years, while most die of old age by thirty. On the Elemental Plane of Air, where nigh-immortal elementals and genies dwell in abundance, it’s hard to notice the difference; whether you live 70 years or 700, many of your neighbors continue on unchanged. On the other hand, those tribes on the Prime Material Plane see the stark difference in years, where generations fly by in the space of even a single human lifespan. While this allows their society to rapidly adapt to changing conditions, it puts history and tradition merely half a century in the past beyond the memory of even the oldest members. Those tribes that choose to interact with their neighbors can face another challenge, the difficulty of maintaining stable relations with other races when their envoys change frequently and have much briefer life experience. A newly assigned envoy might have been born and grown to adulthood in the five years since an important treaty was signed. But how can they compensate for this? There’s been many who’ve searched for ways to add to their allotted years, with few who succeed, but many who lose what years they have in their attempts. Wishes are subject to misinterpretation, lichdom is generally considered socially unacceptable, and artifacts almost invariably have unwanted side effects. Even obtaining one of these methods is highly risky, and the results aren’t guaranteed. However, 18th level druids receive the Timeless Body ability, with which they age only a single year for each decade that passes. While it may take much of the druid’s life to achieve, the wisdom and experience gathered during that time will be available for generations to come. The druid class is already a decent match for Aarakocra, both mechanically and thematically. Aarakocra are limited to light armor if they want to use their ability to fly, so the druidic stricture on metal armor doesn’t affect them. They get a +2 bonus to Dexterity, which helps mitigate the armor restriction, and +1 to Wisdom, which aids with spellcasting. 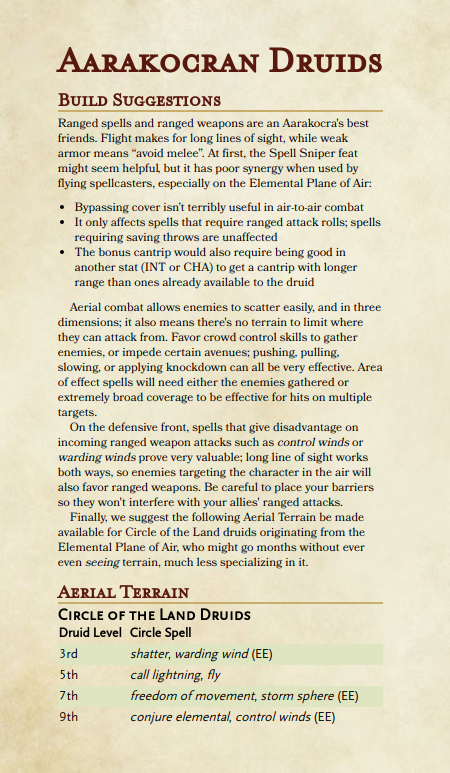 Circle of the Moon druids will find Wild Shape can be used to operate in areas that Aarakocra might normally have difficulty in, such as underground, while Circle of the Land druids will use their enhanced spellcasting to adapt. Their primary disadvantage is range; their longest-ranged weapon is the sling (at 120’), and longest-ranged cantrip is Frostbite (60’). Even in wide-open skies, the druidic Aarakocra will have to get closer to their enemies than their allies with bows or longer-ranged spells would. Druids are also a fairly good thematic match for Aarakocra as well. Tribal leadership among the Aarakocra falls to the eldest of the tribe, with a shaman to advise them; lower level druids would serve as the shaman or assist them. However, most that have reached 18th level will likely have already moved beyond their own tribe to become a champion for their whole colony, giving Timeless Druids a larger role in their society. Many will likely come to be historians, lore-keepers, and sages for their colony, passing along the tales of the past they’ve borne witness to for generations to come. Some Timeless Druids of a more sociable bent might choose instead to serve as diplomats and envoys, bringing continuity and stability to relations between their colony and the longer-lived races. The only thematic caveat is that druids are connected to the land, while Aarakocra, like many denizens of Elemental Air, hold elemental earth in great distaste. However, considering that many human priesthoods help their worshippers with distasteful matters like death or the undead, so too do Aarakocran druids serve as intercessors for the rest of their people, managing the matters of both air and land when they impinge on Aarakocran society. Lennon: Look, this is all well and good, but was any of this actually related to Thanksgiving in any way? …iiiiin unrelated news, Head Scribe Baxter will be off next week so he may attend racial sensitivity training seminars. Again. We apologize to any and all Aarakocra or Thanksgiving turkeys who might have been offended by this segment.